Band on the Wall brings the hugely exciting Oshun back to Manchester! Oshun are an independent hip-hop / soul duo and the sonic manifestation of afro-futurism. Using digital and acoustic sounds, heavy drums, bass and ambient harmonic textures, Oshun connect with the spirit of their ancestors with a vision of manifesting a sweeter tomorrow. 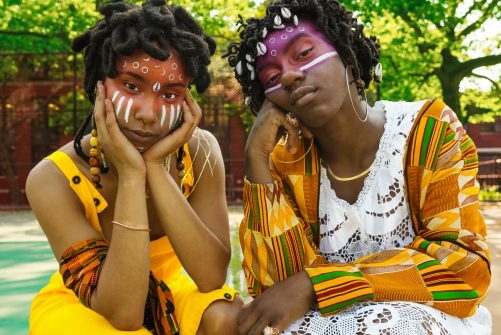 Since the release of their debut mixtape ‘Asase Yaa’ in 2015, Oshun have amassed an huge online following and have been profiled by media tastemakers Rolling Stone, the Fader, Vice, Huffington Post, NPR, Essence, and Vogue. They have also performed throughout the USA and Brazil, all while remaining full-time college students at NYU. The duo are now preparing for the release of their debut LP ‘Bittersweet’ complete with captivating visuals, an international tour and a deeper look into their ever-evolving selves.